Like any ham radio station, the equipment here at WS6X consists of two main parts — The Radio Room, also known as "The Shack", and the Antennas, also often called the "Antenna Farm". 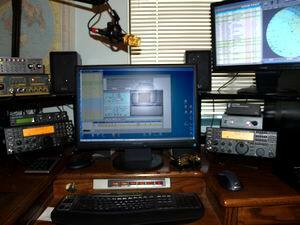 In this section we will take a look at the radios and other equipment in the WS6X shack. A pair of Elecraft radios serve as the heart of the WS6X operation. To a ham, and especially a DX-er, the choice of equipment is a highly subjective, personalized process. To a great degree, a skilled operator can be competitive with modest equipment. Here's another ham truism: when a ham spends $$$ thousand dollars on a new radio, the cost factor alone sets that ham's mental conditioning and that radio quickly becomes "the best radio on the market"! So, we tend to "adjust","make do" and actually "like" the radios we purchase with hard-earned cash! The caliber of equipment in the shack. Please note: These are listed in the order of importance! Here we take a look at the WS6X shack! To a beginner, this shack full of equipment might give the impression that ham radio is a VERY expensive hobby. While the total cost is considerable, please remember that this shack wasn't assembled in a day. What you see is the result of 50+ years of horse trading, and slowly adding equipment to the station — usually, one piece at a time. If you read my story you realize that I started ham radio on a shoestring budget. Even today, a beginning ham can have a lot of fun with a few hundred bucks worth of used equipment and a wire dipole antenna! NCS-3240 Multi-Switcher + Alpha Delta PATHMinder, modified for use as SO2R controller. Mostly used for Field Day.